The Buzz: All You Need is Ice Cream! Hello Friends! I have another ice cream card to share with you. This is such a fun stamp set and it was my desire to create a card using each of the stamps in the set, but...life got in the way. I've used the same image as my previous card, but rather than use glitter, I used Prismacolor pencils. I stamped the image onto Papertrey Ink's Stampers Select card stock. I used Memento Rich Cocoa ink for the stamping. Then I colored the images and blended everything out with Gamsol. I used the polka dot stamp from the set and Orange Peel ink from Simon Says Stamp to create that little border on the bottom. I stamped the greeting in Audrey Blue ink, also from Simon Says Stamp...LOVE that color! Then I adhered all the pieces and gave all of the scoops of ice cream a coating of Rock Candy Distress Stickles. Here's a closer look for you. The Rock Candy Stickles leave chunks of glitter that look like sugar! I applied it with a paint brush to get even coverage. Make sure you clean the paint brush immediately, so it doesn't get ruined. I added a few Sprinkles from the Doodlebug Spring assortment and tied on a bit of Caribbean Baker's Twine to finish off the focal. 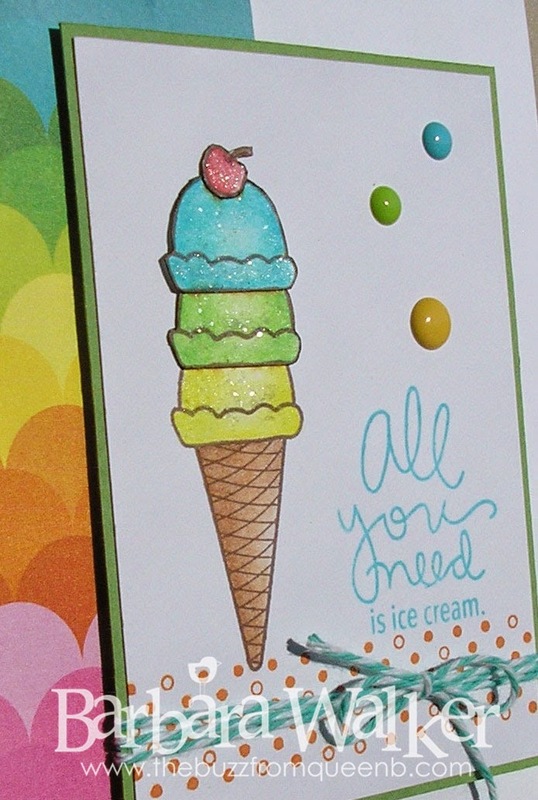 A strip of patterned paper on my card base adds a splash of color and also served as inspiration for the colors on the ice cream cone. Thank you so much for stopping by today. Have a wonderful and SAFE Labor Day Weekend. stamps, Green Apple card stock, patterned papers from the August 2014 Simon Says Stamp Card kit. Oh so delicious, Barb! Love the colors, the coloring and the bling. Makes for a scrumptious card. Well done! Adorable card! Love that sweet ice cream cone and the great colors you used! !